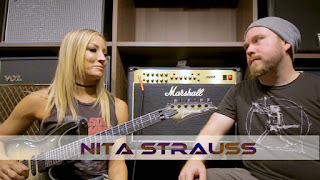 Nita Strauss: New album and Trey Xavier Tries The Nita Strauss Ibanez JIVA10 Guitar At #TGU18! Trey sat down for a chat with Alice Cooper guitarist Nita Strauss at #TGU18 and got to play her new signature Jiva10 guitar from Ibanez! Trey Tries The NITA STRAUSS Ibanez JIVA10 Guitar At #TGU18!